Noctua have reinvented the simple fan controller to allow control of many PWM fans, if required. The NA-FC1 is a compact, highly flexible controller for 4-pin PWM fans that can both work on its own for manual speed reduction and also work in tandem with the automatic motherboard fan control. By adjusting the NA-FC1's speed control dial, users can either manually set a PWM duty cycle from 0 to 100% or reduce the PWM duty cycle supplied by PC motherboards in order to have the fans running slower than the automatic motherboard fan control would allow. While the brightness of the orange status LED provides visual feedback on the current dial setting, the push button allows the NA-FC1 to be switched into "no stop" mode, which prevents the fan from falling below a speed of 300rpm. Thanks to the supplied 3-way split cable and power supply adaptor, up to 3 fans can be controlled simultaneously. 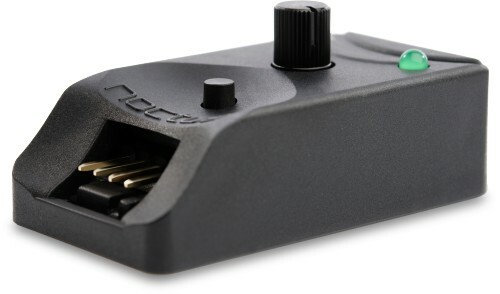 While most fan controllers are voltage based, the NA-FC1 uses the more sophisticated Pulse Width Modulation (PWM) technique that allows for more efficient control and lower minimum speeds, regardless of the fan's starting voltage. If the NA-FC1 doesn't receive an input PWM signal from the motherboard, it works as a simple and efficient manual controller that allows the duty cycle to be set from 0 to 100%. This makes it ideal for manually slowing down high-speed PWM fans such as Noctua's industrialPPC series in order to achieve consistently quiet operation. Many motherboards provide insufficient options to customise automatic fan control or simply don't go below certain duty cycles and speed levels. Using the NA-FC1, you can lower the motherboard's PWM control curve in order to achieve truly silent operation, even with high-speed PWM fans such as Noctua's industrialPPC series. The supplied 3-way splitter cable allows the connection of up to three 4-pin PWM fans in order to control them simultaneously. 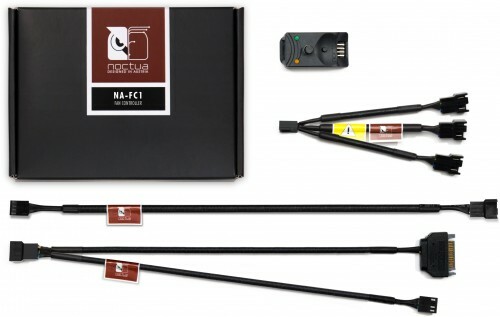 Even more fans can be controlled at once when using additional NA-YC1 splitter cables that are supplied with many Noctua fans and available as an optional accessory kit (NA-SYC1). As powering multiple higher wattage fans from a single motherboard fan header may damage the motherboard, the NA-FC1 includes an NA-AC4 adaptor that powers the device directly from the power supply unit while simultaneously receiving PWM input from the motherboard and forwarding RPM information. This makes it ideal for controlling multiple high-speed fans such as Noctua's 3000rpm industrialPPC models. Noctua products are renowned for their impeccable quality and outstanding longevity. Like all of them, the NA-FC1 fan controller is built to last and comes with a full 6-year manufacturer's warranty. *Please note that many PWM fans have a minimum speed higher than 300rpm and as the function of "no stop" mode is to not let fans go below 300rpm, it is only useful for fans which are generally able to go below this speed. For example, a fan with 500rpm minimum speed will act the same with "no stop" mode on and off.